Apple may adopt a new power-saving backplane technology for iPhone and Apple Watch displays in the long term, which should contribute to longer battery life on those devices, according to research firm IHS Markit. For context, the backplane is responsible for turning individual pixels on and off, meaning that it plays a significant role in determining a display's resolution, refresh rate, and power consumption, as IHS explains. At present, OLED displays in smartphones use LTPS TFT, or low-temperature polysilicon thin-film transistors, as the standard backplane technology. But, in the coming years, IHS believes Apple could switch to LTPO TFT, or low-temperature polycrystalline oxide, for the backplane in future iPhones. In theory, IHS estimates that LTPO can save 5-15% in power consumption versus LTPS, resulting in extended battery life on future iPhones. The reasons for this are quite technical, but from a high level, IHS says that LPTO has an Oxide TFT structure that can reduce the power leakage of LTPS. 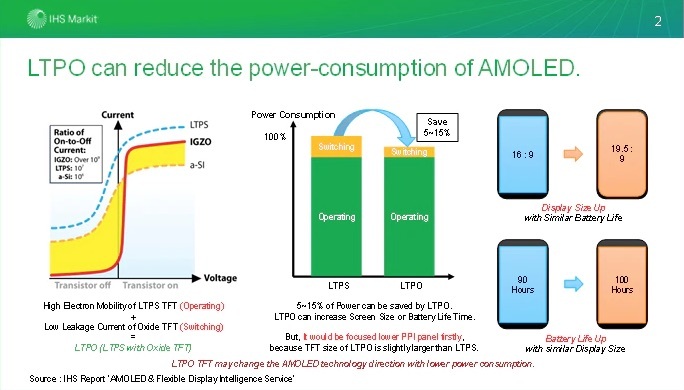 The more technical explanation is that power consumption would be especially reduced under a "switching model," where "the pixel circuit would be patterned such that the switching TFT would be p-Si and the drive TFT would be IGZO." As the size and resolution of iPhone displays continues to increase, power consumption increases, so any battery life gains are beneficial. IHS believes that Apple may also be interested in developing LTPO technology to gain more control over components of OLED displays, as it says manufacturers like Samsung and LG currently maintain exclusive control over the process. Apple currently sources flexible OLED panels exclusively from Samsung, but LG may emerge as a second supplier as it aims for qualification, according to IHS. Samsung and LG are both suppliers of flexible OLED panels for the Apple Watch, too, and IHS says Apple may soon require them to look at LTPO. IHS Markit believes Apple may ask display manufacturers to start deploying LTPO first on the Apple Watch, and then gradually introduce it in the iPhone display over the long term, as it did with OLED first on Apple Watch and then iPhone X.